Bai Tu Long is lying within the area of the gulf of Tonkin, on the northeast of Vietnam. This tourism site is located 60 km from Bai Chay tourist centre and situated in Halong commune, Van Don District, Quang Ninh Province. 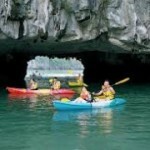 It comprises a part of Halong’s sea, Cam Pha town and Van Don Island District. It’s next to Halong Bay on the southwest, bordering with the sea on the east, with Cam Pha town on the west and with Co To island district on the northeast. The bay is a long string of islands which was created when the entire limestone plateau sank below sea level. There are a rich biodiversity with 2 main ecosystems: a tropical, moist, evergreen rainforest ecosystem; and a marine and coastal ecosystem. It is estimated that there are 391 species of marine creatures, most of which bring about high economic and scientific value. Bai Tu Long and Halong has the same legendary story. According to legend, an immense dragon descended to Ha Long Bay (meaning “Descending Dragon”) millions years ago, dropping numerous eggs. These eggs hatched forming thousands of rocks and islands. The tail of the dragon extended far to the sea, forming Bach Long Vi (meaning “The Tail of the White Dragon”). As she returned to heaven, she said good bye to her offspring at the Bai Tu Long Bay (means “The dragon parts the offspring”). 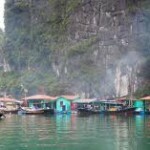 Bai Tu Long Bay has great potential for developing tourism. Along with Halong Bay, Bai Tu Long Bay is one among the wonderful natural wonders, with beautiful islands and long-white-sandy beaches. Bai Tu Long is well-known not only for its natural beauty, but also for notable attractions as Quan Lan beach, Co To Island, Van Don Island and the fishing village of Vung Vieng. Van Don Island is one of the main highlights of Bai Tu Long Bay as it’s the first island you come to, the most developed, and is connected to the mainland by bridge. 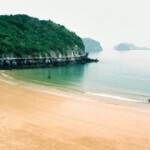 Quan Lan Island offers 3 white sandy beaches Quan Lan, Minh Chau and Son Hao. You can rent a tuk tuk to drive around 15km from North to South of this island. The bay is also home to the large must-seen Bai Tu Long National Park, one of seven Vietnamese amphibian national parks which has both terrestrial zone and aquatic zone. It represents Vietnam’s sea preservation site, which has attracted a larger number of both domestic and foreign tourists. Visitors can get there by speedboat or by road from Bai Chay Beach. A trip to Bai Tu Long can be done with minimum 2 nights stay required. The best way to take advantage of Bai Tu Long Bay is to get on a boat tour/ high speed hydrofoil from Hon Gai tourist wharf in Halong city, or go from Cai Rong pier on Van Don Island to the more remote islands, or by bus from Hanoi to Cua Ong pier, from where ferries leave for the archipelago. Some buses also run across the bridge and onto Van Don Island. The trip from Hanoi is straightforward via Highway 18 and takes about four hours. If you’re from Saigon, just take a flight with Vietnam Airlines to Hai Phong airport, then bus transfer from Hai Phong city to Cai Rong pier (120km). 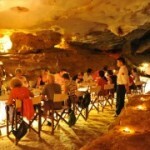 Bai Tu Long is still an uncharted bay in Ha Long and promises to be a popular tourist attraction in coming time. By taking trip to this stunning bay, visitors will not only have a chance to get “off the beaten track” but also make the trip unforgettable.